A birthday party for a monumental disaster strikes me as a bit macabre, but a centennial is a centennial and does give one pause. The disaster that now is known simply as; “The Titanic” has permeated our cultural consciousness for decades now. Countless books; fictions and non, have been published. Theatrical pieces (including a musical!) have been produced. Films have been made and remade. It simply goes on and on. For some the fascination is that of the magnitude of the loss of life, for others the boldface names on-board, capture the imagination. Other “fans” are nautically curious, or scholars of the early 20th century class system. Some are captivated by the less romantic aspects such as the arrogance of insufficient life boats or search and rescue endeavors. If my imagination is captured by anything (aside from the buoyancy of one Molly Brown) it is that of the shifts in our culture since that fateful voyage. By looking at the physical construct of the ship, compared to luxury liners of today we can chart the course of some of the ways in which we’ve changed. The expectation of creature comforts at least equivalent to what one experiences at home does not seem a new phenomenon. No doubt, smaller spaces and shared bathing facilities were not all that unknown to people in 1912. The modern “bigger is better” phenomenon is American in its origin and the (international) tourism industry is now on board with that. A tiny “plunge bath” was the swimming pool of the day. The tank of seawater was rather brisk and bracing the water was seen as an act of manly fortitude. You can’t swing a water wing without hitting a heated playground of a pool on today’s ships. They are enormous and fitted with slides and other gewgaws. Esther Williams would risk a head injury emerging from the depths of one of those pools. Today’s ships have full-scale auditoriums/theatres. Mini versions of musicals are often performed, as are all other forms of splashy entertainment. 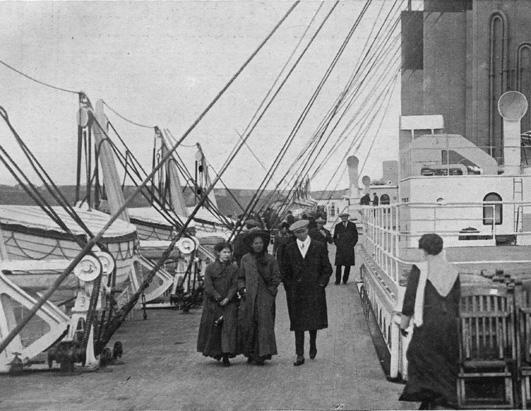 Public spaces on the Titanic were predominately reading and writing rooms and comfortable places to socialize. Bars, discos, casinos, shopping and shore excursions are how people “socialize” on today’s ships. Of course the fundamental difference was that the Titanic was seen as a means to end. It was a very nice way to travel. A cruise on the other hand is seen as the destination itself. But still, it is interesting to consider that there was a time we considered a morning of written correspondence, followed by a stroll on deck, a meal or two, a little reading and perhaps catching up and/or meeting new people to be a thoroughly entertaining day. It is safe to say that there are many of us who now do all those things at once in the span of one hour.